A couple of experts liked how the Irox GTX Mid protected their feet from water encounters. Its breathability was efficient, based on some written reviews. Several boot owners declared that the Lowa Irox GTX Mid was a lightweight gear. The grippy outsole received praises from a considerable number of users. A small group of hikers appreciated the tight laces of the Irox GTX Mid from Lowa. The full-length shank provided solid stability underfoot, as observed by an outdoor adventurer. According to loads of wearers, this backpacking boot had decent ankle support. A considerable number of testers approved of the locking eyelets that allowed them to fine-tune the fit. A few backpacking aficionados stated that it took too long to break it in. The cushioning from the stock insole was lacking, as mentioned by a handful of disappointed testers. A gear blogger stated that this boot runs a tad narrow. The Lowa Irox GTX Mid received high regard from the outdoor community. Its outstanding benefits include comfort, protection and security on trails. These good points did not mask the boot’s unsatisfactory features though. All in all, the Lowa Irox GTX Mid can be a companion on virtually all types of terrain. However, hikers must be willing to spend time breaking it in and compensate its insufficient cushioning. This is a great early-season or mid-season hiking boot. Ultimately the boots were great. The Irox GTX Mid is a very capable trekking boot, providing solid support and ample protection from rough trails. Lowa created the Irox GTX Mid to offer a balance between comfort and flexibility. The brand’s Elika outsole helps tackle a variety of terrain. Protecting the foot from trail debris is a synthetic upper with toe and heel reinforcements. It is lined with a Gore-Tex laminate which renders all-day comfort. The dual-density DuraPU and Climate Control footbed grant a cozy ride. It works with a medium stabilizer for support. 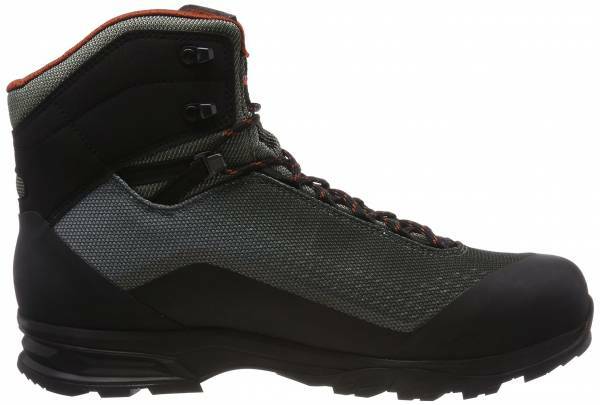 A men’s backpacking boot, the Lowa Irox GTX Mid comes in regular sizes and medium width. It fairly runs true to size. The traditional front closure allows fit customization and its ankle lace hook enables easier flex. The Elika outsole makes the Lowa Irox GTX Mid able to grip on most terrain. Its multi-directional lugs increase ground contact. Also, it has a pronounced heel edge which optimizes traction on descents. It can be resoled (the sole can be replaced), for a cost. The Lowa Irox GTX Mid uses a dual density DuraPU. It offers a shock absorbent and comfortable underfoot cushioning. It works with the Climate Control footbed which has a breathable top layer and helps reduce fatigue on long hikes. A full-length medium stabilizer is added to optimize support. This mid-cut backpacking boot has a full synthetic upper with TPU toe and heel caps. This design, crafted with minimal seams, renders a protective, flexible and durable upper. The Gore-Tex Extended Comfort laminate lines the inside to maximize breathability and waterproofing. Its padded tongue and collar add comfort. The combination eyelets allow for a more straightforward closure. Other backpacking boot options from the brand include Lowa Tibet GTX and Lowa Camino GTX.